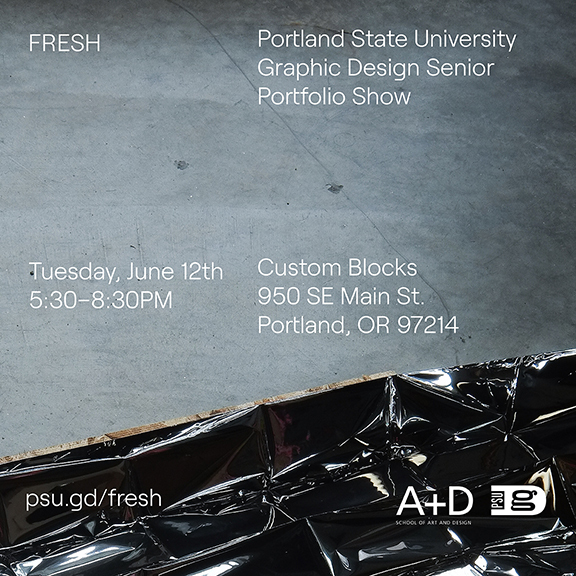 Portland State Graphic Design FRESH! Senior Portfolio Show! It’s time for the Spring 2018 edition of PSUGD’s FRESH! On June 12th, you are invited to the fabulous Custom Blocks as 41 soon to be grads takes over this huge space with their work! They are so excited to share and show their work with you all! If you are looking to work with one of our FRESH Grads, register here! (registration is required). If you are a current student, please attend our friends & family hour from 4:30 to 5:30 (no registration required). Big thanks to our sponsors Custom Blocks, Half Court Studio, Rogue Ales, Coffee/Beer, Sizzle Pie, and New Seasons.